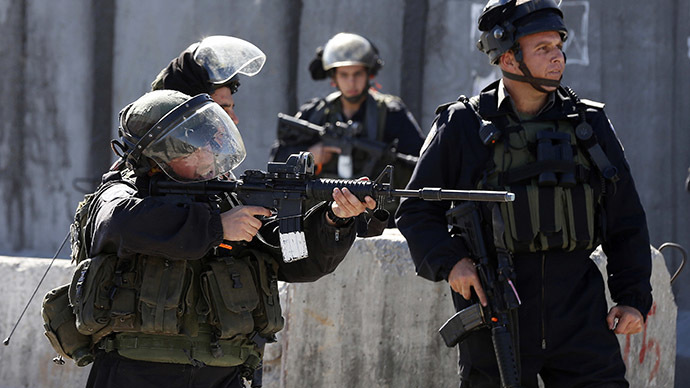 A Sixteen-year-old Palestinian armed with a large knife was shot dead by Israeli troops in eastern Jerusalem. Israeli police said he tried to attack border patrol officers near a checkpoint. The police statement said that the Palestinian youth began running towards the Israeli Defense Force (IDF) officers wielding a knife. One of the officers pushed him away and teenager started to sprint towards the crossing. The report says officers warned that they would shoot if the youth didn’t stop. Border patrol officers at the crossing shot the Palestinian as they saw him running in their direction. Police spokeswoman Luba Samri added that the border police first fired warning shots into the air. When the youth failed to stop, troops “fired precise shots neutralising him [the suspect],” Reuters cited Samri as saying. Medical staff at the scene said the teenager died of his injuries. The incident happened at around midnight near the A-Zayyim checkpoint in the occupied West Bank, which was captured by Israel in 1967. Tensions in the Jerusalem areas have been on the rise since the Gaza conflict that killed 2,200 people in 50 days in 2014. On Friday, Israeli tanks responded with fire after a rocket was fired from Gaza during Independence Day celebrations. No casualties were reported. Meanwhile, Britain and France are urging the UN Security Council to restart the Israeli-Palestinian peace process. New Zealand has begun drafting a resolution on the issue. France and New Zealand have stressed that it is imperative to act now, given that the Israeli elections are over and there is a current lull in the US before the presidential election campaign heats up. Last week, Israel has agreed to transfer taxes it has been withholding from the Palestinian Authority since December, according to the Palestinian prime minister. Israel started retaining taxes in response to Palestine's decision to join the International Criminal Court. Under a 1994 economic agreement, Israel has been transferring customs duties to Palestine for the funds moving through its territory.